This is the eternal question, what happens when we die? Is there just nothingness or is there a beautiful life awaiting us. Surely this question should be the most important question facing humanity. It should be more important than money, politics, your career and anything else and yet most people don’t even think about this question until there lying on their death bed. Our lives are very short, some even shorter. Given that the end is fast approaching surely people should invest in some time to research the possibility of a life beyond the physical. Death is something that is not brought up in many conversations. It could be that people have a fear of the unknown, a fear of something they don’t understand. If people do bit of research maybe they will lose that fear. When a loved one dies people go through grief, despair, sadness and many negative emotions but just think all that could be eradicated if they knew their loved one survived the death of the body and one day they would meet up with them. the fact that physical life is already terribly hard, unfair and difficult for many people. Dr. Hereward Carrington, Dr. Harry Price, and Elisabeth Kübler-Ross, M.D. and many, many more. There is many skeptics about whether consciousness survives beyond the physical body. They will say I saw them die, if they are alive why can’t I see them. However just because you cannot see something that does not mean it does not exist. For instance television and radio signals are a form of energy which carry pictures and sound through the air over many miles. You cannot see this energy but it exists. It is the same with consciousness or the soul that survives the death of the body. You can’t prove that the soul does not exist but there is a vast amount of evidence to suggest that the soul or consciousness leaves the body at death and travels to another life beyond. Let’s look at some of this evidence. In the video below Colton Burpo aged 3 went to heaven during an operation on his ruptured appendix, and at now age 11, tells what he saw and heard! As the medical world has become more and more sophisticated in its resuscitation techniques, a greater number of us are surviving and being brought back ‘from death’s door’, and the incidents of near death experiences are therefore rising. A team of researchers at Southampton University in the UK recently conducted one of the largest ever studies about what happens to consciousness after death. The conclusion: We still don’t know what happens, but consciousness and awareness appear to linger for some time after physical death, suggesting that consciousness and the body are entangled actors somehow, and that may unravel and follow separate paths after what we refer to as death. “The evidence thus far suggests that in the first few minutes after death, consciousness is not annihilated. Whether it fades away afterwards, we do not know, but right after death, consciousness is not lost. We know the brain can’t function when the heart has stopped beating. But in this case conscious awareness appears to have continued for up to three minutes into the period when the heart wasn’t beating, even though the brain typically shuts down within 20-30 seconds after the heart has stopped. This is significant, since it has often been assumed that experiences in relation to death are likely hallucinations or illusions, occurring either before the heart stops or after the heart has been successfully restarted. but not an experience corresponding with ‘real’ events when the heart isn’t beating. Dr. Eben Alexander was a neurosurgeon and Assistant Professor of Research in Neurological Surgery, University of Virginia Medical School, in the U.S.A (2008). Long before this book was ever written, Dr. Alexander was a practicing neurosurgeon and a lifelong “science skeptic.” He did not believe in consciousness, free will or the existence of a non-physical spirit. Trained in western medical school and surrounded by medical colleagues who are deeply invested in the materialism view of the universe, Dr. Alexander believed that so-called “consciousness” was only an illusion created by the biochemical functioning of the brain. He believed NDEs were simply fantasies produced by brains under extreme stress. His opinion was soon to change. Dr. Alexander was at home when he was struck down with severe pains in his head. He was rushed to hospital with a severe brain infection which turned out to be meningitis of the brain. He was in a coma for seven days. The doctor’s said that if he did come out of his coma that he would not be able to talk or walk properly and he would suffer other physical impairments. After seven days he came out of his coma and went on to make a full recovery. His recovery is regarded as a medical miracle. During his seven days in his coma Dr. Alexander said he left his body and journeyed beyond this world and encountered an angelic being who guided him into the deepest realms of the Afterlife. The angelic being turned out to be his half-sister whom he had never met because he was adopted and she had died when she was young. Sometime after Dr. Alexander came out of his coma did he then meet up with his long lost mother and the other half of his family that he never met. He then saw a photo of his half-sister who had died young and realized she was the angelic being in his near death experience. This could not have been his brain giving him this experience because his brain had shut down completely while he was in his coma. Dr. Eben Alexander now believes God and the soul are real and that death is not the end of personal existence but only a transition. If you want to read the full story get his book Proof of Heaven, a Neurosurgeon’s Journey into the Afterlife by Dr. Eben Alexander. Remember, Dr. Alexander is a neurosurgeon. This guy knows the physical brain like no one else. Dr. Bruce Greyson documented perhaps one of the most compelling examples of a person who had an NDE and observed events while outside of his body which were later verified by others. The only way that these events could have been observed by the experiencer was if in fact he was outside of his body. Al Sullivan was a 55 year old truck driver who was undergoing triple by-pass surgery in 1988 when he had a powerful NDE including an encounter with his deceased mother and brother-in-law, who told Al to go back to tell one of his neighbors their son with lymphoma will live. Furthermore, during the NDE, Sullivan accurately noticed the surgeon, Dr. Hiroyoshi Takata, operating on him was "flapping his arms as if trying to fly" with his hands in his armpits. When he came back to his body after the surgery was over, Sullivan's cariologist was startled that Sullivan could describe Dr. Takata's habit of arm flapping. It was Dr. Takata's idiosyncratic method of keeping his hands sterile and pointing out to surgical instruments and giving instructions to surgical staff. Another example of evidence that a person's consciousness leaves and returns to their body during an NDE comes from the research of Dr. Melvin Morse. Olga Gearhardt was a 63 year old woman who underwent a heart transplant because of a severe virus that attacked her heart tissue. Her entire family waited at the hospital during the surgery, except for her son-in-law, who stayed home. The transplant was a success, but at exactly 2:15 am, her new heart stopped beating. It took the frantic transplant team three more hours to revive her. Her family was only told in the morning that her operation was a success, without other details. When they called her son-in-law with the good news, he had his own news to tell. He had already learned about the successful surgery. At exactly 2:15 am, while he was sleeping, he awoke to see his Olga, his mother-in-law, at the foot of his bed. She told him not to worry, that she was going to be alright. She asked him to tell her daughter (his wife). He wrote down the message, and the time of day and then fell asleep. Later on at the hospital, Olga regained consciousness. Her first words were "did you get the message?" She was able to confirm that she left her body during her near-death experience and was able to travel to her son-in-law to communicate to him the message. This anecdotal evidence demonstrates that the near-death experience is a return to consciousness at the point of death, when the brain is dying. Dr. Melvin Morse thoroughly researched Olga's testimony and every detail had objective verification including the scribbled note by the son-in-law. When all of Pam's vital signs were stopped, the doctor turned on a surgical saw and began to cut through Pam's skull. While this was going on, Pam reported that she felt herself "pop" outside her body and hover above the operating table. Then she watched the doctors working on her lifeless body for awhile. From her out-of-body position, she observed the doctor sawing into her skull with what looked to her like an electric toothbrush. Pam heard and reported later what the nurses in the operating room had said and exactly what was happening during the operation. At this time, every monitor attached to Pam's body registered "no life" whatsoever. At some point, Pam's consciousness floated out of the operating room and traveled down a tunnel which had a light at the end of it where her deceased relatives and friends were waiting including her long-dead grandmother. Pam's NDE ended when her deceased uncle led her back to her body for her to re-entered it. Pam compared the feeling of re-entering her dead body to "plunging into a pool of ice." The following is Pam Reynolds' account of her NDE in her own words. The next thing I recall was the sound: It was a Natural "D." As I listened to the sound, I felt it was pulling me out of the top of my head. The further out of my body I got, the more clear the tone became. I had the impression it was like a road, a frequency that you go on ... I remember seeing several things in the operating room when I was looking down. It was the most aware that I think that I have ever been in my entire life ...I was metaphorically sitting on [the doctor's] shoulder. It was not like normal vision. It was brighter and more focused and clearer than normal vision ... There was so much in the operating room that I didn't recognize, and so many people. The saw-thing that I hated the sound of looked like an electric toothbrush and it had a dent in it, a groove at the top where the saw appeared to go into the handle, but it didn't ... And the saw had interchangeable blades, too, but these blades were in what looked like a socket wrench case ... I heard the saw crank up. I didn't see them use it on my head, but I think I heard it being used on something. It was humming at a relatively high pitch and then all of a sudden it went Brrrrrrrrr! like that. Someone said something about my veins and arteries being very small. I believe it was a female voice and that it was Dr. Murray, but I'm not sure. She was the cardiologist. I remember thinking that I should have told her about that ... I remember the heart-lung machine. I didn't like the respirator ... I remember a lot of tools and instruments that I did not readily recognize. There was a sensation like being pulled, but not against your will. I was going on my own accord because I wanted to go. I have different metaphors to try to explain this. It was like the Wizard of Oz - being taken up in a tornado vortex, only you're not spinning around like you've got vertigo. You're very focused and you have a place to go. The feeling was like going up in an elevator real fast. And there was a sensation, but it wasn't a bodily, physical sensation. It was like a tunnel but it wasn't a tunnel. At some point very early in the tunnel vortex I became aware of my grandmother calling me. But I didn't hear her call me with my ears ... It was a clearer hearing than with my ears. I trust that sense more than I trust my own ears. The feeling was that she wanted me to come to her, so I continued with no fear down the shaft. It's a dark shaft that I went through, and at the very end there was this very little tiny pinpoint of light that kept getting bigger and bigger and bigger. I noticed that as I began to discern different figures in the light - and they were all covered with light, they were light, and had light permeating all around them - they began to form shapes I could recognize and understand. I could see that one of them was my grandmother. I don't know if it was reality or a projection, but I would know my grandmother, the sound of her, anytime, anywhere. Everyone I saw, looking back on it, fit perfectly into my understanding of what that person looked like at their best during their lives. I recognized a lot of people. My uncle Gene was there. So was my great-great-Aunt Maggie, who was really a cousin. On Papa's side of the family, my grandfather was there ... They were specifically taking care of me, looking after me. They would not permit me to go further ... It was communicated to me - that's the best way I know how to say it, because they didn't speak like I'm speaking - that if I went all the way into the light something would happen to me physically. They would be unable to put this me back into the body me, like I had gone too far and they couldn't reconnect. So they wouldn't let me go anywhere or do anything. I wanted to go into the light, but I also wanted to come back. I had children to be reared. It was like watching a movie on fast-forward on your VCR: You get the general idea, but the individual freeze-frames are not slow enough to get detail. Then they [deceased relatives] were feeding me. They were not doing this through my mouth, like with food, but they were nourishing me with something. The only way I know how to put it is something sparkly. Sparkles is the image that I get. I definitely recall the sensation of being nurtured and being fed and being made strong. I know it sounds funny, because obviously it wasn't a physical thing, but inside the experience I felt physically strong, ready for whatever. But then I got to the end of it and saw the thing, my body. I didn't want to get into it ... It looked terrible, like a train wreck. It looked like what it was: dead. I believe it was covered. It scared me and I didn't want to look at it. It was communicated to me that it was like jumping into a swimming pool. No problem, just jump right into the swimming pool. I didn't want to, but I guess I was late or something because he [the uncle] pushed me. I felt a definite repelling and at the same time a pulling from the body. The body was pulling and the tunnel was pushing ... It was like diving into a pool of ice water ... It hurt! When I came back, they were playing Hotel California and the line was "You can check out anytime you like, but you can never leave." I mentioned [later] to Dr. Brown that that was incredibly insensitive and he told me that I needed to sleep more. [laughter] When I regained consciousness, I was still on the respirator. For practical purposes outside the world of academic debate, three clinical tests commonly determine brain death. First, a standard electroencephalogram, or EEG, measures brain-wave activity. A "flat" EEG denotes non-function of the cerebral cortex - the outer shell of the cerebrum. Second, auditory evoked potentials, similar to those [clicks] elicited by the ear speakers in Pam's surgery, measure brain-stem viability. Absence of these potentials indicates non-function of the brain stem. And third, documentation of no blood flow to the brain is a marker for a generalized absence of brain function. But during "standstill", Pam's brain was found "dead" by all three clinical tests - her electroencephalogram was silent, her brain-stem response was absent, and no blood flowed through her brain. Interestingly, while in this state, she encountered the "deepest" NDE of all Atlanta Study participants. “The brain isn’t functioning. It's not there. It's destroyed. It's abnormal. But, yet, it can produce these very clear experiences ... an unconscious state is when the brain ceases to function. For example, if you faint, you fall to the floor, you don't know what's happening and the brain isn't working. The memory systems are particularly sensitive to unconsciousness. So, you won't remember anything. But, yet, after one of these experiences [an NDE], you come out with clear, lucid memories ... This is a real puzzle for science. I have not yet seen any good scientific explanation which can explain that fact." One of the most fascinating long-term demonstrations of psychic phenomena took place in the late 90's, and is known as the Scole Experiment. This is frequently acknowledged to be one of the strongest proofs of existence of the afterlife which exists. The Scole Experiment is widely regarded as one of the most successful paranormal experiments ever conducted involving communication with the dead. In 1943, at the age of 20, Dr. George G. Ritchie, Jr., M.D., (September, 25, 1923 – October 29, 2007) was a private in the Army stationed in Texas awaiting a transfer to Richmond to study medicine at the Medical College of Virginia to become a doctor for the military. However, he got sick with pneumonia and died. The Army physician in charge stated in a notarized statement that the medical officer summoned detected "no evidence of respiration or cardiac impulse" and declared Ritchie dead. Ritchie had left his body in a near-death experience wandering around the hospital ward unaware he was dead. He found it strange no one could see him. He returned to his room and recognized his lifeless body, which had been covered with a sheet, by his fraternity ring. The room then became bright and Ritchie found himself in the presence of Jesus who then guided him through several realms of the afterlife before being told to return to his body. As the ward was preparing Ritchie's body for the morgue, he thought he detected movement in Ritchie's chest and called for a medical officer who provided a shot of adrenaline to the patient's heart causing him to breathe and his heart to beat. Ritchie then returned to life with one of the most important and profound NDEs every documented. The being tells Ritchie to stand up. Ritchie is astonished to learn he is standing before Jesus Christ. More than anything emanating from Jesus was the unbelievable amount of unconditional love shining from him - a love that knew everything about Ritchie and loved him just the same. Simultaneously, as Jesus appeared to him, Ritchie watches his entire life displayed before him. Jesus asks him, "What have you done with your life?" Ritchie tries to come up with several examples but realizes he has fallen short. Ritchie eventually realizes Jesus is not judging him at all; but rather, Ritchie was judging himself. And the question "What have you done with your life?" had more to do with "How much unconditional love have you given others." Then Jesus begins to take Ritchie on a journey through various realms of the afterlife. You can read his entire NDE testimony in his book, Return From Tomorrow. On November 18, 1973, Betty Eadie succumbed to complications due to a partial-hysterectomy surgery and had a near-death experience. Afterwards, Betty suffered with depression so painful was her separation from the light of love - she experienced during her moments of clinical death. Twenty years later, after sharing her story with family and friends, and with critically ill cancer patients, Betty was urged to write her experience so that a wider audience might share its beauty. Betty Eadie leaves her body through her chest and floats above her bed. Three hooded monk-like beings appear whom she identifies to be her guardian angels. They tell her that they have been with her for "eternities" and that she died prematurely. Concerned about her family that she left behind, she travels in spirit to her home to see them; but she discovers that she cannot be seen by them. Betty then returns to her body where her guardian angels are waiting for her. I saw a pinpoint of light in the distance. The black mass around me began to take on more of the shape of a tunnel, and I felt myself traveling through it at an even greater speed, rushing toward the light. I was instinctively attracted to it, although again, I felt that others might not be. As I approached it, I noticed the figure of a man standing in it, with the light radiating all around him. As I got closer the light became brilliant - brilliant beyond any description, far more brilliant than the sun - and I knew that no earthly eyes in their natural state could look upon this light without being destroyed. Only spiritual eyes could endure it - and appreciate it. Two close friends appear to Betty whom she knew before she was born. They embrace and go on a tour of the spirit world. They enter a large room and see people creating heavenly garments using heavenly looms of some kind. In another room, she sees people working with a large computer-like machine. They enter another room similar to a library. It is a library of the mind. They go outdoors to a garden where beautiful mountains and rivers can be seen in the distance. It is a realm more beautiful than words can describe. After her life review, she is told her mission in life is not complete and must return. "Above all, I was shown that love is supreme. I saw that truly without love we are nothing. We are here to help each other, to care for each other, to understand, forgive, and serve one another." - Betty Eadie. Mellen-Thomas Benedict is an artist who survived a near-death experience (NDE) in 1982. He was dead for over an hour and a half. During that time, he rose up out of his body and went into the light. Curious about the universe, he was taken far into the remote depths of existence, and even beyond, into the energetic void of nothingness behind the Big Bang. 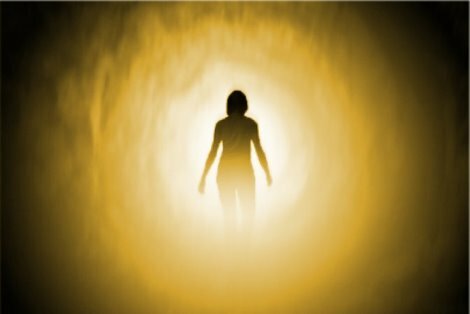 Eminent near-death experience researcher Dr. Kenneth Ring has said, "His near-death experience story is one of the most remarkable I have encountered in my extensive research on near-death experiences." It was the most beautiful thing I have ever seen. It was like all the love you've ever wanted, and it was the kind of love that cures, heals, regenerates. I was ready to go at that time. I said "I am ready, take me." Then the Light turned into the most beautiful thing that I have ever seen: a mandala of human souls on this planet. I saw that we are the most beautiful creations—elegant, exotic ... everything. I just cannot say enough about how it changed my opinion of human beings in an instant. I said/thought/felt, "Oh, God, I didn't realize." I was astonished to find that there was no evil in any soul. People may do terrible things out of ignorance and lack, but no soul is evil. "What all people seek—what sustains them—is love," the Light told me. "What distorts people is a lack of love." It has often been said that of those who have reported NDEs the most interesting group is children. Dr. Ian Stevenson was a psychiatrist who worked for the University of Virginia School of Medicine for 50 years. He became internationally recognized for his research into reincarnation by discovering evidence suggesting that memories and physical injuries can be transferred from one lifetime to another. He traveled extensively over a period of 40 years, investigating 3,000 cases of children around the world who recalled having past lives. His meticulous research presented evidence that such children had unusual abilities, illnesses, phobias and philias which could not be explained by the environment or heredity. During his original research into various cases involving children's memories of past lives, Dr. Stevenson did note with interest the fact that these children frequently bore lasting birthmarks which supposedly related to their murder or the death they suffered in a previous life. Stevenson's research into birthmarks and congenital defects has such particular importance for the demonstration of reincarnation, since it furnishes objective and graphic proof of reincarnation, superior to the - often fragmentary - memories and reports of the children and adults questioned, which even if verified afterwards cannot be assigned the same value in scientific terms. This story sounds unbelievable until you dive into the facts behind it. Many cultures believe in reincarnation, but it’s a rare belief system in the West. What would you do if your child, early on in life, began talking about his past life? In the case of this young man’s story, he had a lot to say. He insisted that he remembered a past life in which he was murdered. He even led his parents to the spot where he died and told them to start digging. A few feet down, they found a body. He also led his parents to the location of an ax that he said was used in his murder. His parents think the ax wound on the corpse’s head explains the boy’s red birthmark on his forehead. The boy was even able to reveal the name of his murderer, a man who later confessed to the crime. In his book, “Children Who Have Lived Before: Reincarnation Today,” German therapist Trutz Hardo tells this boy’s story, along with other stories of children who seem to remember their past lives with verified accuracy. The boy’s story was witnessed by Dr. Eli Lasch, who is best known for developing the medical system in Gaza as part of an Israeli government operation in the 1960s. Dr. Lasch, who died in 2009, had recounted these astounding events to Hardo. He was born with a long, red birthmark on his head. The Druze believe, as some other cultures do, that birthmarks are related to past-life deaths. When the boy was old enough to talk, he told his family he had been killed by a blow to the head with an axe. The boy also remembered the full name of his killer. When he confronted this man, the alleged killer’s face turned white, Lasch told Hardo, but he did not admit to murder. The boy then said he could take the elders to where the body was buried. In that very spot, they found a man’s skeleton with a wound to the head that corresponded to the boy’s birthmark. They also found the axe, the murder weapon. Faced with this evidence, the murderer admitted to the crime. Dr. Lasch, the only non-Druze, was present through this whole process. Did the spirit of a murdered woman come back and name her killer through dreams and channelled messages? Teresita was a 47 year old respiratory therapist who worked at the now defunct Edgewater Hospital. On the evening of that day in 1977 the shrill sirens of Chicago fire engines pierced through the cold winter air in the neighborhood of Teresita’s apartment building at 2740 N. Pine Grove Avenue. Fire fighters weren’t really prepared for what they saw inside of apartment 15B when they arrived. After putting out the fire they discovered the burned, unclothed body of Teresita with a kitchen knife sticking out of her chest and covered by her mattress. It quickly turned into a murder investigation and after a couple of months and a few leads the case went cold. Everything changed when Detective Joe Stachula of Area 6 homicide found a note on his desk to contact the Evanston Police Department about the Teresita Basa Case. He was told by the Evanston Police to contact a Dr. Jose Chua in Skokie. Dr Chua told them that his wife, Remebios “Remy” Chua might be “possessed” by the spirit of the murdered gir, Teresita Basal. Dr. Chua stated that his wife would go into a trance-like almost comatose type state and during these episodes claimed to be the spirit of Teresita Basa! Initially Stachula and Epplen were probably wondering why they were wasting their time. Suddenly, however, Dr. Chua stated that he didn’t believe it either until he demanded proof from the voice. He said that the voice said that it needed help in solving the murder and that the murderer’s name was Allan Showery. It also stated that Showery went to the apartment of Teresita in order to fix a television set and that Showery had stolen jewellery from Teresita’s apartment and that the jewellery was purchased in France as a gift from Teresita’s father to her mother. It also stated that Showery gave the stolen jewellery to his girlfriend. All of this could have been a guess until the voice gave the names of specific individuals who could identify the jewellery and also the telephone numbers of the individuals! The individuals were Ron Somera, Ken Basa, Richard Pessotti and Ray Kings. Unbelievably, there was an orderly named Allan Showery who worked at Edgewater Hospital with Teresita. The detectives thought it was worth a shot and initially went to Showery’s apartment at 630 W. Schubert where he lived with his girlfriend, Yanka Kamluk. They asked Showery to voluntarily accompany them to the police department because they thought he could help in the investigation of the murder of Teresit Basa. Showery agreed and Kamluk stayed at the apartment. Allan Showery plead guilty to Teresita's murder. While at the police station Epplen and Stachula caught Showery in a number of lies and he actually stated that he went to Teresita’s apartment the night of the murder to fix her television but that she had called him to cancel so he went home to fix an electrical problem. The detectives decided to go back to the apartment and speak to Showery’s girlfriend. She stated that Showery knew nothing about any electrical problem and said that Showery doesn’t know anything about fixing electrical problems. They asked her if Showery had given her any jewellery lately and she stated that the pendant that she was wearing and the ring she was wearing were given to her as a late Christmas gift. One of the detectives called the individuals on the list that was given them by the “voice” of Teresita and asked them to come to the police station. Kamluk and Teresita’s relatives showed up at the police station around the same time and the family positively identified the jewellery as having been Teresita’s! Under the pressure of these new developments Showery caved and gave a full confession. The trial started on January 21, 1979 and while the defence tried to block the psychic testimony the judge allowed it. The trial ended in four weeks in a mistrial because the jury was hopelessly deadlocked. Amazingly, Showery plead guilty while awaiting a new trial. He was sentenced to fourteen years for the murder and four years each for aggravated arson and robbery. He was released in 1983 after only serving less than five years. hundred paranormal voice recordings (lasting from 10 to 55 minutes each) in the presence of the direct voice medium Leslie Flint (1911-1994). Leslie Flint must have been the most tried, proven and tested medium of the 20th century, without anyone, over a period of 60 years, ever being able to disprove him or expose him as a fraud. Firsthand experiences of Leslie Flint's seances forced skeptics to either give up their world view or try to make something up to have it seem as if it was anything other than the actual paranormal voices that could be clearly heard throughout the darkened seance room! Woods, Betty Greene and many others from the mid 1950's to early 1990's.